• suitable for all DEXRON III requirements. 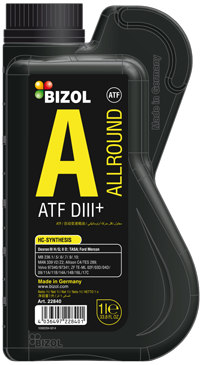 BIZOL Allround ATF D-III+ is a transmission fluid for automatic gearboxes and hydraulic clutches that require an ATF Dexron III specification. This product ensures a proper functionality even under extreme operating conditions and considerable temperature fluctuations. It is also applicable for hydraulic systems that work under hard operating conditions.